It's another contest entry for the annual Food & Wine Conference in Orlando, Florida. Once again, Idaho Potato Commission is a title sponsor and is sponsoring this contest. Our challenge? 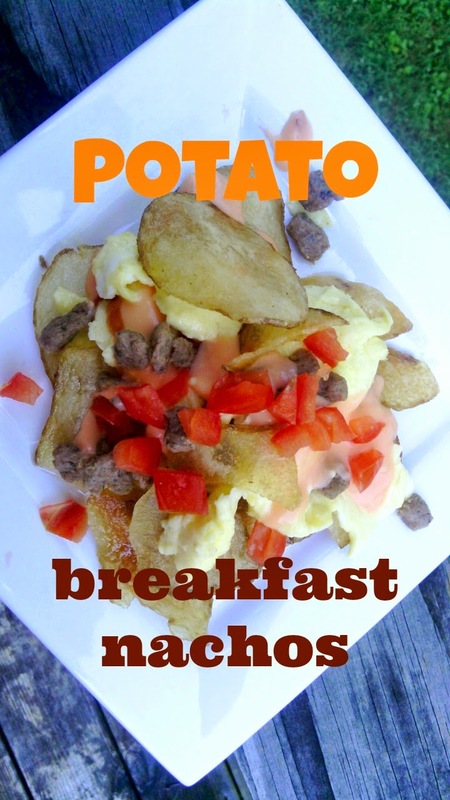 Reinvent breakfast potatoes. The contest was announced in April and I've been racking my brain since then, trying to come up with a winning recipe that might net me cash, prizes and hopefully a trip to Idaho! Potatoes are from the Americas and have been eaten for breakfast since God's dog was a puppy, so reinventing them? A very arduous task. 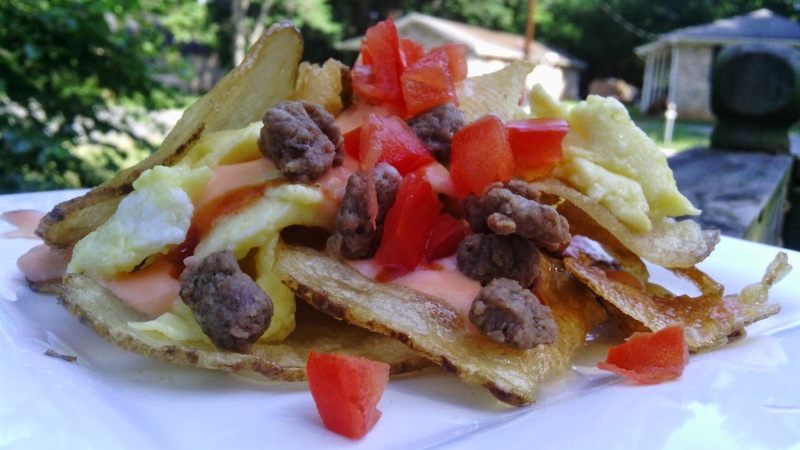 Who wouldn't like hot, crispy, thinly sliced, seasoned Idaho potatoes layered with an unctuous, creamy, cheese sauce, bits of country sausage, dotted fresh, diced tomatoes and softly layered scrambled eggs? A fool. That's who. It's the best of both worlds: a protein packed dish that is creative, simple to make and easy to customize for you and your family. Wash and scrub your potatoes first. Slice potatoes to a 1/8 inch thickness on mandoline or use a sharp chef's knife to achieve the same results. After slicing your potatoes, submerge them in a bowl or container filled with water to wash off the starch and keep them from oxidizing (turning black). This step can be done a day ahead. Be sure to dry the potatoes with a clean dish towel or paper towels before frying. The excess moisture will prevent the chips from crisping and lower the oil temperature. For perfect, fluffy scrambled eggs, low and slow is the way to go. Crack your eggs into a bowl and beat your eggs with a fork or a whisk to incorporate air and to break the yolks. After putting the eggs in a well-oiled, hit pan, turn the great to low or medium low and slowly flip the eggs do that the bottom becomes the top and the top goes to the bottom of the pan, creating soft layers that help the eggs stay moist and fluffy. Incorporate warm milk into your flour mixture while making the cheese sauce to prevent lumps. Using fresh Idaho potatoes in place of tortilla chips is ingenious, I think. Bón appetít! There's still time to join me in Orlando at the Food & Wine Conference. Use code: NikSnacks to get $50 off your ticket price. There's also still time for you to enter this contest. Hop to it! Preheat the vegetable over medium-high heat in a stock pot or Dutch oven. While the oil heats, line a sheet tray with paper towels. To check if oil is hot enough, put a tiny pinch of salt in the oil. If it sizzles, it's ready! Carefully add the slices 1 at a time to the hot oil. Using a slotted spoon, constantly move the slices in the hot oil for 3 to 4 minutes or until golden brown and crisp. Remove the chips with the slotted spoon, and let excess oil drain. Place the chips on the lined sheet tray and season with salt and pepper. Let the oil come back to frying temperature and fry the remaining potatoes in small batches. Season. Meanwhile, in a large skillet, crumble the bulk sausage. Use a fork to separate the sausage crumbles and cook over medium heat until no longer pink. Use a slotted spoon to transfer the sausage to the lined sheet tray with the potato chips to drain. In a medium saucepan over medium heat, melt butter and stir in flour. Pour in the milk and stir with a whisk until the mixture thickens. Stirring constantly, mix in cheese and hot sauce. Continue to cook and stir until cheese has melted and all ingredients are well blended, about 8 minutes. Heat a heavy-bottomed sauté pan over medium-low heat. Add butter and let it melt. Pick up the pan and swirl it around to coat the bottom of the pan with the butter. Crack the eggs into a mixing bowl and beat them with a whisk until they turn pale yellow. Add the eggs to the hot pan and let them cook for one minute or until they start to set. Use a spatula and gently push one edge of the egg into the center of the pan and tilt the pan to allow the uncooked egg to flow in underneath. Repeat with the other edges. Turn off the heat and continue gently stir the egg until all of the eggs become firm. Transfer to a plate when the eggs are set but still moist and soft. Place the potato chips on a large platter. 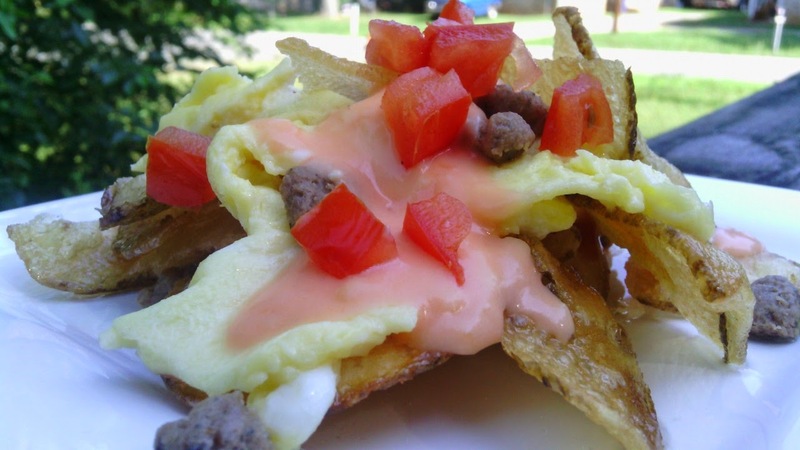 Layer the sausage, eggs, cheese sauce and diced tomatoes over the chips. Yum yum! 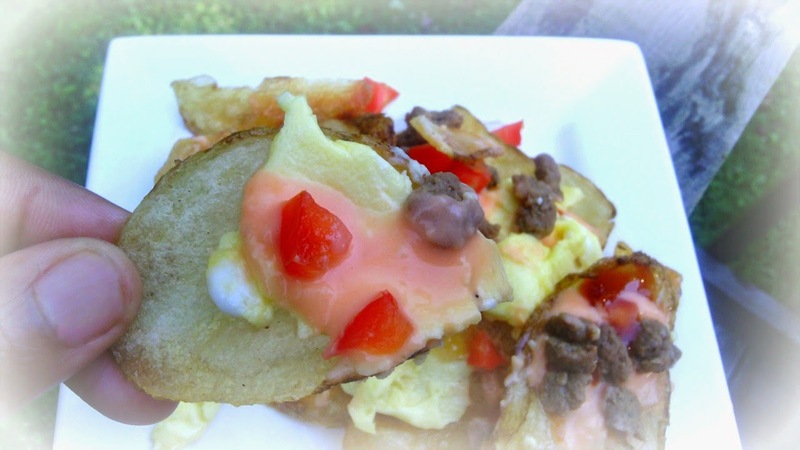 I am all about that cheese sauce...and I've always wanted to make homemade chips!